I participated in an Influencer Activation on behalf of Influence Central for Boys & Girls Clubs of America. I received a promotional item to thank me for my participation. Did you know that June is Internet Safety Awareness Month? Throughout the month, the Boys and Girls Club of America (BGCA) and Spring are inviting you to ask their panel of Boys & Girls Club teens from around the world your biggest questions regarding your online privacy, cyberbullying, social networking and other cyber-related safety issues. As a mom to a techno-gamer kid, I worry about Jacob’s safety online. I have more relaxed rules than a lot of parents because I raised Jacob from age two to be cyber smart. Yep, age two. That’s when I bought him his first kiddie keyboard, attached it to my computer and set him loose. Obviously, I was right there the whole time! Also, that keyboard blocked his access to most of the computer. I’ve always loved technology. I knew my son would grow up in a world where understanding technology wasn’t just a plus but a must. As he’s grown, I’ve taught him how to avoid viruses, which sites were well-known for phishing and drive-by malware, and how to keep his identity as safe as possible. He doesn’t sign up for anything without my permission. Still, as a busy single mom, I can’t keep up with all the latest technology the way I used to. I am sure I’m missing something. It seems like every day a new social media platform pops up! Plus, Jake speaks a whole different language when he’s talking about his favorite games. I have questions, just like everyone else does. When you have questions about keeping tweens and teens safe online, the best person to ask is another teen. Remember when we were younger and thought our parents totally didn’t understand us? That’s because no matter how cool we are (and let’s be honest, I’m pretty darn cool), there’s still a generation gap between us and our kids. Sure, we may keep a running dictionary of all the updated slang, but I doubt any of us actually know when to use the word “fleek.” I can’t even tell you what that means, except that I don’t like it because it sounds like a bodily function. That right there is why I’m not qualified to answer questions about teenagers: I just don’t speak their language. BUT, the BGCA Cyber Safety Ambassadors are quite amazing. They’re teenagers, so they absolutely understand where our kids are coming from, yet they know how to talk to adults in a way we can understand. So you can ask them any question about cyber safety and they will give you a straight answer from a teen point of view on CyberSafeFutures.org. Plus, after you submit a question, you can enter for a chance to win an iPad mini! My son spends a lot of time in gaming environments online. Do you have any tips that I can share with my son to help him learn to recognize possible predators, such as potential pedophiles pretending to be other children? Where can parents go to learn about the different types of “gamer” language that kids and teens use in gaming environments so we can better understand what they and their friends are talking about and recognize bullying language or other threats? My son wants to share gaming experiences on YouTube like other gamers he loves, where he does a voice over with the game playing on the screen. Is this safe? Should I take any precautions before letting him do it? I’ll be keeping an eye on the BGCA’s Cyber Safe Site to see if my questions make it onto the site. Questions will be updated each week in June for Internet Safety Month. By getting answers to your questions and sharing it with other moms, we can all help keep our kids safer online! Visit BGCA’s Cyber Safe Site and submit your own cyber safety questions now! Tell me if they answer your question so I can check it out! Currently, my son is 8 years old, so in anticipation of the teen years, this is a great resource. Thank you so much for sharing. At every age, I feel you have to monitor your children’s internet usage, simply as a way to continue their safety while still having fun with their games. It really is scary what is out in the internet that kids can find! These are great ways to help protect your kids. I can’t even imagine how hard it can be to keep the kids safe on the internet. My son is in a few gaming communities online and that worries me. I do not understand te language nor do I trust that the people he plays with are not old men trying to get young boys to play with them. I am thankful for this post to give me somewhere I can find some answers. My daughter spends a good deal of time online chatting and playing games with classmates and friends. 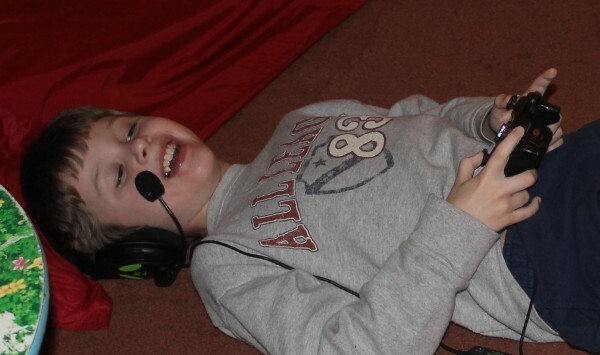 She’ll be 12 in a couple of days and like your son, she started early so she knows her way around the www. I’m a helicopter, so I try to stay on top of every site she visits, but I can’t be there every second and half of the time I on’t understand the lingo. Thank you for posting this. I have a few questions for the BGCA myself. I work in childrens’ online media, and recently acquired a teenage stepson, so this is a topic near and dear to my heart. I think it’s very interesting to see how far gaming has come since I was a teenager, and to see how my stepson and his friends use the internet to communicate and entertain. But working int he field I do, I know how important it is to be involved and know what he’s up to online. I was involved with BGCA growing up and it’s also interesting to see how they’re evolving as an organization, I think they nailed this one! “Understanding technology wasn’t a plus but a must.” I LOVE that line. I feel like it should be the official internet safety campaign slogan! I’m really into your techy educational ways, especially in that you started sharing the necessity for safety with your son at such an early age. We cant keep our kids from technology, my son is 2 years old right now and when I put a dvd on for him, there’s previews that tell him to “go to disney.com” and the boy is listening, then repeating, “disney.com, disney.com.” I did not know that June was Internet Safety Awareness Month! This was a great post, thanks for sharing! This is great for parents to have a piece of mind when their children are on the internet. Thankfully, all of my kids are young, so they are not hanging out online yet. However, in one or two years I probably am going to need this. I had no idea it was Cyber Safety Month or it even existed. however, the lack of privacy our children are being raised to understand is too much for me. Just today speaking with my daughter about Disney banning selfie sticks. It’s just too much posted online with tagged locations. Cyber Safety is something to start very, very early for sure. My daughter is going to be 5 and we want to get her her first computer of her own. We want to lock it down with software that resembles a school or library computer so she remains safe online but we know we will have to closely monitor her computer time and what she does on it.